“What is the role of the citizen in a zero waste Birmingham? “ This was the question posed at a Climathon, a marathon international event, which was recently hosted by Innovation Birmingham. As waste campaigners we could not stay away since a zero waste Birmingham sounds like the right goal (although far from today’s reality). Our team of John Newson, Maria Marsden and Libby Harris had 24 hours in the bowels of the Novatel hotel to come up with some solutions. The problem we identified is that the current involvement of citizens is to mix up potentially recyclable items with waste food and other smelly stuff to make “rubbish”, which is then burned in the incinerator at Tyseley to emit 322,000 tonnes of CO2 a year into the air. This was originally required by the City Council’s 25-year contract with waste giant Veolia, which happily ends in 2018, after which citizens are free to change their relationship with waste. Birmingham’s recycling rate is only 30% compared with Wales, which recycles 60%. The main difference is that in Wales all the authorities collect food waste in separate bins from their households. Other West Midlands councils such as Sandwell do this, so we believe Birmingham people could, too. Our first step is to imitate this system using existing vehicles, teams etc., to separately collect the waste. People have been happily signing our petition in support of such a change. The primary purpose is to remove the organic contaminant, leaving a waste stream of items that could be sold for recycling instead of rubbish. What to do with the waste? If a regular tonnage of organic waste could be guaranteed, then it will be worth companies investing in anaerobic digestion (AD) plants to consume it, and, in fact, they already are doing so to cope with the waste from the commercial food industry. Our solution will only work if there is a high value use for the resulting bio-gas, i.e. methane that is made by the bacteria, while fossil fuels are rather cheap. For this, we were inspired by the Bio-Bus that runs between Bristol Airport and the city centre. It is fuelled by gas made from food waste and sewerage, but looks like any bus and it provides a normal service. Diesel fuel is expensive and polluting as we know, so replacing it with gas gives both financial and environmental savings. We understand that such bio-buses are running in Barcelona, a twin city of Birmingham, so this is definitely a feasible option. Our suggestion is therefore to involve the citizen by linking up household waste with public transport. Not for the first time, since in Birmingham one hundred years ago vehicles were horse-drawn and fuelled by grass etc., while waste food was collected as pig food, so this is really a reinvention, using 21st century technology in which the AD plant replaces the animals’ digestion and the bus engine their muscles. AD actually produces a by-product of fertilizer, an equivalent to animal manure. The quantity probably would not power all buses, but the primary aim is to remove a contaminant that prevents recycling. The bio-bus would give residents a very visible use for their waste, in powering a local bus service that everyone can use. The residents of an area would feel they were feeding their bus service, having a collective purpose and motivation to participate, unlike the current waste system which really offers no incentive. Free bus tickets might be given to regular contributors. 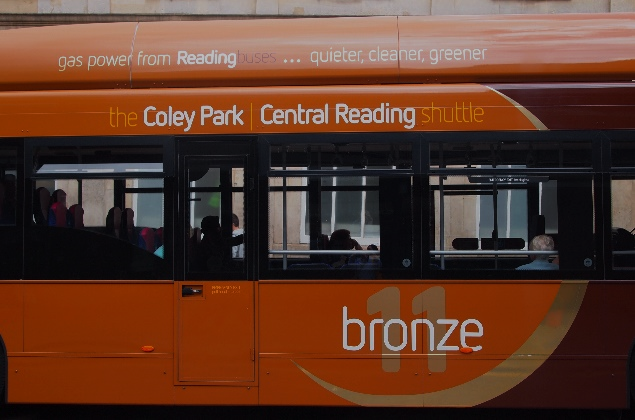 Buses can act as moving advertisements for the scheme. This would also boost the visibility and popularity of the bus service, which is a key element in the new Birmingham Connected transport plan to get the city away from its unusual dependence on the private car. Our idea was well received at the event and we hope to take it forward soon. If you can help then please get in touch with Birmingham Friends of the Earth.